second oldest town in the county. after which it is named. It was the main line of the Chicago, St. Paul, Minneapolis & Omaha railroad and was the terminus of the Black Hills branch of that line. As a railroad point Heron Lake surpassed every other town in Jackson County. A very fertile farming country surrounds the town of Heron Lake. In 1870, there was great activity in railway circles and it was rumored that the St. Paul & Sioux City road would extend its line through southwestern Minnesota, passing just to the north of Heron Lake. This prompted some farsighted people to begin locating homesteads in the prairie country around Heron Lake. Said the Jackson Republic of April 2, 1870: "At Heron Lake, in the northwest corner of the county, there is quite a settlement; the prospect of the early completion of the St. Paul & Sioux City railroad and the possibility that it will pass in this vicinity have called here a good number of settlers." The track of the Sioux City & St. Paul railroad was not laid through Jackson County until the fall of 1871, but in the spring of that year the route was selected and sites for stations chosen. The Heron Lake site was selected late in June, but nothing was done toward platting or building a town there until a short time before the track laying was completed in the fall. The roadbed was graded to the site in September, and surveyors appeared late in that month to survey the town site, although the plat was not put on record until the next spring. The town was surveyed by Alex L. Beach and the dedication was made by the Sioux City & St. Paul Railway company, by Elias F. Drake, its president. The dedication was made April 22, 1872, the original plat consisting of eleven blocks. While the surveyors were yet dividing the land into blocks and lots and before the railroad was completed to the prospective town, in the month of October, the first inhabitants came. They were John T. Smith and C. H. Carroll, who had been conducting a store at Big Bend, in Cottonwood County, to which place it had been believed the railroad would build. The route having been changed and Heron Lake selected as a site for a town; Messrs. Smith and Carroll abandoned their location at Big Bend and came to engage in business in the new town. They found the site raw prairie land, without a stick on it, and had to burn a strip of prairie grass to get a place to pile their lumber. Mr. Smith bought a lot on Main street – the first lot sold in the new town – but had to wait for the surveyors to subdivide block seven before he could locate his lot, which was number fifteen. The partners hauled lumber from Mankato to start their store building, but before it was finished the railroad was completed and lumber was shipped in. Almost simultaneously the three first buildings were put up. These were the general store of Smith & Carroll, the drug store of Dr. R. R. Foster, and the Heron Lake Depot. Only two other business houses were started before the close of the year 1871. The lumberyard of Crocker Brothers & Lamoreaux, with J. A. Town as manager, was opened for business early in November. A little office building was erected, but the lumber stock was piled in the open. The other enterprise was the Pioneer Hotel, which was built by John Robson on the present site of the Farmers State Bank building and which was opened for business late in the fall. The Heron Lake post office was established in November. John T. Smith was the postmaster, and he conducted the office in his store. 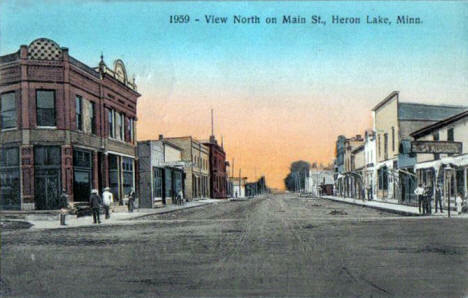 The village of Heron Lake had been founded too late in the fall to make much progress during 1871, and the four business houses before mentioned were the only enterprises started in the year of founding. But in 1872, when train service was established on the new road and the surrounding country was rapidly settling with new arrivals, the little village was the scene of much activity. During the summer months nearly every train brought new comers to locate upon the fertile lands in the vicinity, and the town grew in proportion. A correspondent to one of the Twin City papers, writing in September, said: "This village, which sprang into existence last fall, is rapidly growing and becoming the center of trade for a large tract of country. New buildings are constantly being erected, and the place bids fair to be a town of considerable importance ere long." Knute Thompson opened a small hardware store – a branch for H. L. Parker, of St. James – in the spring of 1872, which was under the management of Mr. Thompson for a time and later of Mrs. Graves. Smith & Carroll bought the stock in September. J. W. Benson & Company erected a commodious two-story building during the summer and opened a general merchandise store in September. Smith & Carroll built a fourteen-foot addition to their store to meet the increasing demands of their trade and erected the town’s first warehouse, which was ready to receive grain in September. Pixley & Stone opened a saloon. Mr. Pixley became sole owner. Dr. Foster bought the Pioneer house and made improvements on it. Mr. Jones became the landlord. Ralph Town became the manager of the Croker Brothers & Lamoreaux lumber yards. George Hubbs opened the town’s second lumber yard in November and erected a residence. J. B. Pixley opened a furniture store. H. J. Bosworth, the station agent, took the agency for agricultural implements and vehicles and put in a small stock. William Dahl built a residence and ran a boarding house. John Weir erected a building next to John T. Smith’s store late in the fall and engaged in the hardware business. During 1872 a mail route was established between Heron Lake and Currie, by way of the Graham Lakes country, which was in operation until 1879. The citizens dug a public well in the middle of Main Street, which was considered quite an improvement at that early date. The first birth in the village occurred in 1872, when a child was born to Mr. and Mrs. H. J. Bosworth. Heron Lake had a population of about fifty people when it was one year of age. The number engaged in business and the population of the town during the first year of its history does not convey a truthful idea of its importance as a trading point. Its merchants drew trade from an immense territory. For long distances north and south Heron Lake was the only railroad town, and retail trade came there from countries now tributary to Slayton, Avoca and Fulda, from half way to Worthington, half way to Windom, half way to Jackson, and for the time from the Big Bend country. In addition to having the retail trade of this large territory, Heron Lake was the distributing point for a much larger territory, much of the goods sold to merchants of Jackson, Spirit Lake, Iowa, and other interior points coming by way of Heron Lake. During the first two years of the town’s history its merchants did an immense business and prospered. *John T. Smith, general store. *Johnson & Dieson, general store. *J. W. Benson & Company, general store. *R. R. Foster, drug and furniture store. *R. *R.E. Town, lumber yard. 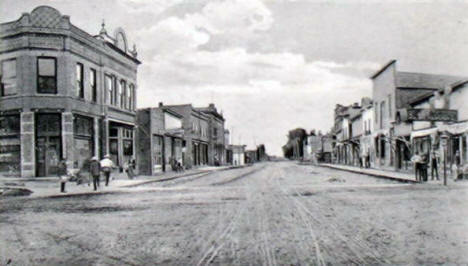 As did the other towns of southwestern Minnesota during the terrible grasshopper scourge, Heron Lake suffered severely. During these years – 1873-1878 – no progress was made; the town was at a standstill and the merchants lost their profits of former years. In 1875 the population was estimated at nearly 100, and the following lines of business were represented: Three general stores, one hardware store, two hotels, warehouse, photograph gallery, shoe shop, furniture store, machinery depot, two lumber yards, one fuel yard. Early settlers of Jackson County were predominately family people seeking new opportunities not only for themselves but also for their children. Whether they took up land for farming or whether they engaged themselves in business for the professions they established for themselves three basic priorities. The first was to build shelter for humans and livestock. The second was establishment of churches. And the third was to provide for education through public and parochial schools. Although they didn’t know it at the time Jackson County people in 1910 were about to begin the most dizzying, accelerating spiral of technological progress in all of human history. In every aspect of their lives they were to be caught up in changes they could neither control nor fully comprehend. Within the life span of many of those living in that year would be the jump from the horse drawn plow to the 16-row planter and the eight-row combine, from the one-page printing press to color television, from the dirt road to Interstate 90, from herbal medicine to hospitals at Jackson, Heron Lake and Lakefield, from 40-bushels per acre of corn to 100 or more, from wheat as the number two crop to soybeans as the number one, and from the one-room country school to the Jackson Area Vocational-Technical Institute.